Just how good is Paladin Moving Company? Ask any of our highly satisfied customers! Now that the dust has settled and most of our boxes have been unpacked, we would like to take this opportunity to thank you for the excellent service your men provided when we moved on September 11 from Yonkers to Irvington. Your men, Billy, Bob, and Alex, literally worked non-stop for 4.5 hours during a hot, humid Friday. Nothing was damaged or even scratched during the move. 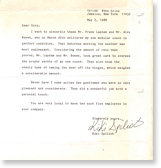 Your men were friendly, helpful, and accommodated every one of our wishes -- always with a smile. I would be pleased to recommend you to anyone looking for a moving company. P.S. 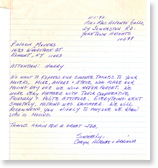 I would appreciate it if you would bring the contents of this letter to the attention of Billy, Bob, and Alex. I want to sincerely thank Mr. Frank Lapham and Mr. Alex Bowen, who on March 25th delivered my new modular couch in perfect condition. That Saturday morning the weather was most unpleasant. Considering the amount of rain that poured, Mr. Lapham and Mr. Bowen took great care to oversee the proper safety of my new couch. They also took the unduly task of taking the door off its hinges, which weighed a considerable amount. Never have I come across two gentlemen who were so very pleasant and considerate. They did a wonderful job with a personal touch. You are very lucky to have two such fine employees in your company. On April 3rd I used Paladin Moving Company for the third time in six and a half years. The three men did an outstanding job in moving and setting up the new apartment. I would highly recommend their services to others. I would like to thank the Paladin crew that did my move on May 19th: Mike, Bob, and Alex. . . . I appreciated their care in handling my furniture and goods. I would appreciate your passing my thanks on to them for the good job they did. We want to express our sincere thanks to your movers, Mike, Andre, and Steve, who made our moving day one will we never forget. We were very pleased with their cooperative, friendly, and polite attitude. Everything went smoothly, nothing was damaged. We will recommend you highly to anyone we know who is moving. You people have made my moving day almost joyful. Your men were prompt, respectful, and polite, just as my daughter said they were when she moved three months ago. Today I was moved by your company and was very pleased and satisfied with their performance. I would highly recommend your company to anyone I know who would be moving. Everything was properly wrapped, nothing was broken or chipped. Most of all, the fellows themselves were very pleasant and polite. Thank you for your services. Paladin Movers moved my family and me from New Rochelle to Smithtown. I was very happy and amazed at the job the three young men performed. I couldn't believe how organized and careful they were. They took special care of all the furniture and the fragile pieces. 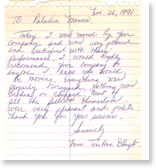 My husband and I were very pleased we chose Paladin Moving Company for our needs. When you call Paladin, you know the job will get done the right way.